Obama tells Israel: "Peace is the only path to true security"
Speaking before a lively and receptive crowd of 600 Israeli students, President Obama today urged the youth of Israel to accept "the realization of an independent and viable Palestine." A two-state solution, the president suggested, is the only viable path forward for Israel, given the political and technological changes underway. "Peace is necessary. I believe that," Mr. Obama said, speaking at the Jerusalem International Convention Center on his second day in Israel. "I believe that peace is the only path to true security. You have the opportunity to be the generation that permanently secures the Zionist dream, or you can face a growing challenge to its future." With the fast-moving developments in the Middle East sparked by the Arab Spring and the spread of democratizing technology, Mr. Obama said, "This is precisely the time to respond to the wave of revolution with a resolve and commitment for peace." "Peace must be made among peoples, not just governments," he continued. "No one step can change overnight what lies in the hearts and minds of millions.... But progress with the Palestinians is a powerful way to begin, while sidelining extremists who thrive on conflict and division." 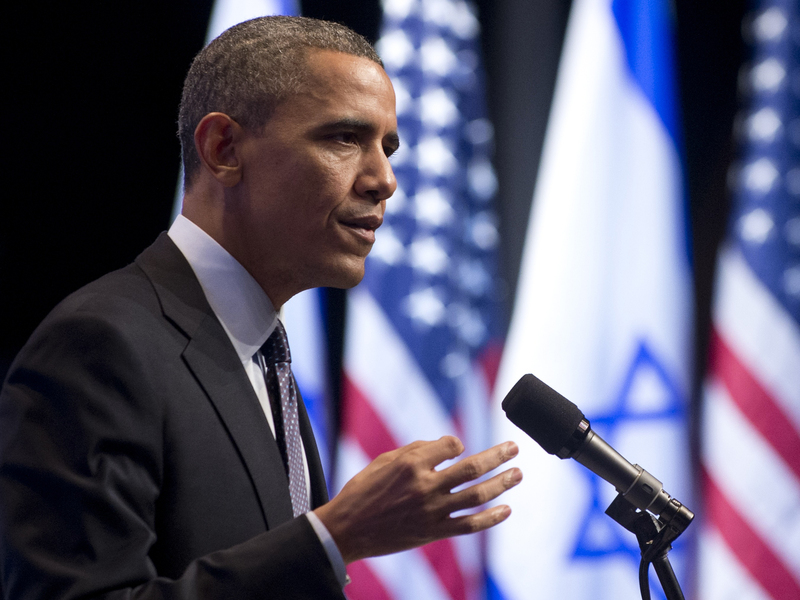 Mr. Obama noted that, given the strong support for Israel in the U.S., it would be easy for him to put aside the idea of pursuing a two-state solution. However, he added, "It is important to be open and honest, especially with your friends." "Given the demographics west of the Jordan River, the only way for Israel to endure and thrive as a Jewish and democratic state is through the realization of an independent and viable Palestine," Mr. Obama said, prompting cheers from the young audience. Mr. Obama hailed Israel's thriving economy and robust democracy, remarking on the robust debate that young Israelis engage in. He even found the silver lining when a heckler in the crowd began yelling in Hebrew for the release of Jonathan Pollard, a Jewish-American intelligence analyst who spied for Israel. "This is part of the lively debate that we talked about -- this is good," he said, bringing the audience to give him a standing ovation. He joked, "I have to say we arranged for that because it actually made me at home. I wouldn't feel comfortable if I didn't have at least one heckler." Mr. Obama said that while he backs a two-state solution, "the only path to peace is through negotiation... That is why, despite the criticism we've received, the United States will oppose unilateral efforts to bypass negotiations through the United Nations." He also said that Israel cannot be expected to negotiate with anyone who is dedicated to its destruction. Still, he said, "Palestinians - including young people - have rejected violence as a means of achieving their aspirations. There's an opportunity there -- there's a window." The president made an appeal for empathy, noting that before delivering his speech, he met with a group of young Palestinians, between the ages of 15 and 22. "Talking to them, they weren't that different from my daughters. They weren't that different from your daughters or sons," he said. "I honestly believe if any Israeli parent sat down with those kids, they'd say, 'I want these kids to succeed.'" Mr. Obama also argued that Israel's growing prosperity is tied to its efforts to find peace, noting that it should build strong trade relations with countries around the world. "One of the great ironies of what is happening in the broader region is that so much of what people are yearning for - education and entrepreneurship, the ability to start a business without paying a bribe, to connect to the global economy - those things can be found, here in Israel," he said. He also spoke about the importance of security, declaring that "the security relationship between the United States and Israel has never been stronger. Never." The Iranian government is "under more pressure than ever before," the president said, adding, "This is not a danger that can be contained." Is the "red line" on Syria's chemical weapons blurring? Mr. Obama backed Israel's right to defend itself from rockets in Gaza and said that "every country that values justice should call Hezbollah what it truly is - a terrorist organization." The fact that Syrian -- Hezbollah's ally -- has stockpiles of chemical weapons "only heightens the urgency," he added. He said the U.S. will continue to watch the situation in Syria, declaring, "Assad must go so that Syria's future can begin." Speaking on the eve of Passover, Mr. Obama tied Israel's current quest for peace to the Jewish people's historic struggle for freedom. "Just as Joshua carried on after Moses, the work goes on for all of you, the Joshua generation," he said, "for justice and dignity, for opportunity and freedom."